On Feb. 15, Albion was named an official Trail Town by the North Country Trail Association (NCTA), a non-profit organization comprised of volunteers who partner with the National Park Service to create and maintain a multi-state trail composed of local trail systems. The 4,600 miles long North Country National Scenic Trail runs from New York to North Dakota. The Albion River Trail is part of the North Country Trail. This larger trail is quickly becoming a major attraction for hikers across the country. Trail Town designation is given to communities who complete the NCTA’s Trail Town application process. This includes passing a resolution through City Council, going over city plans and showing to the nonprofit the city’s commitment to promoting trails and welcoming hikers to the NCTA. As a town whose trail connects to several other larger trails — such as Michigan’s Iron Belle Trail and the Calhoun County Trailway — the City of Albion hopes to properly provide trailway support. In September 2017, a 1.2-mile expansion of the Albion River Trail opened, adding Victory Park and Riverside Cemetery onto the mostly paved path. Gregg Strand, a member of the Calhoun County Trailway Alliance, a city planner and director of corporate and foundation relations for Albion College, has been working with the City and the college to fundraise for grants to make trail expansion and maintenance a priority in Albion. With its Trail Town designation, Albion is also given its own page on the North Country Trail Association’s website that includes information on local businesses and attractions. Mark Lelle, president of the Calhoun County Trailway Alliance, thinks the designation will introduce more hikers to Albion and support the local economy by providing services to hikers. Lelle says he hopes that this designation is just the beginning of an influx of people in the hiking and biking community that will now recognize Albion as a great town to stop through. Lelle cited the Great Allegheny Passage in Pennsylvania had an estimated overall direct economic impact of 50 million dollars in 2012 for communities along the trail. Although not all of the trail along the North Country National Scenic Trail has been officially “finished,” another goal for volunteers like Lelle is to have most of the trail that runs through Albion be off the road in order to keep hikers and bikers safe. “If it’s off the street, it’s considered finished even if it’s just a gravel trail,” said Lelle. 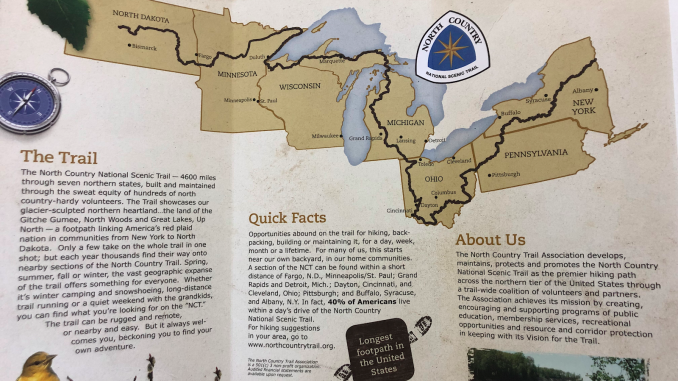 Keep an eye out for the North Country Trail Association markers, featuring the yellow star against a blue background (pictured above).